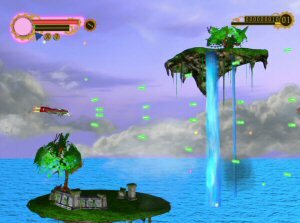 Towering Skies is an old-school side-scrolling shoot’em up developed by students from the Full Sail University and distributed for free. The player is a mercenary pilot of a ship named Skytanic that has defend his world of Solis by fighting off the invading alien forces of Xentera. The steampunk setting reminded us of the acclaimed digital download game Sine Mora from Digital Reality and Grasshopper Manufacture, with the floating isles and such, but obviously the quality of Towering Skies is inferior to that game. Nonetheless, it’s a compelling project, one that ticks most boxes in the shoot’em up genre. So, we have high resolution graphics, smooth side-scrolling, waves of different enemies, plenty of bullet hell type moments, power-ups, huge bosses and, why not, some frustrating deaths that will probably make you punch the keyboard and rage quit. To fulfill our task the three types of weaponry will be essential – laser, missiles and a devastating ray of death. Colored dots improve our firepower and obviously the more powerful weapons need to be recharged before using them again. The action will take us through some beautiful but dangerous blue skies, but also through hazardous caves with falling rocks, lethal creatures and giant, deadly blades. At the end of the cave is a boss waiting, some kind of colossal larva that has a few tricks up its sleeve, including an undesired one-hit death blast. Sometimes it’s also difficult to distinguish scenario from objects where we can collide, but after a couple of games we’ll have learned to navigate perfectly. Gameplay is sharp and fluid, not really outstanding but Towering Skies is a freeware game absolutely worth downloading.